Responsive wordpress magazine theme with 3 home page layouts, 2 page layouts including a full width page template, featured posts, social icons, twitter updates, threaded comments, custom background and widget support. Cell is a clean, lightweight WordPress theme allowing you to create any type of website you want. Cell features: custom background, drop-down menu, header logo, highly customizable and adaptable, theme options, post excerpts with thumbnails, SEO friendly, translation ready, W3C valid, widget-ready, threaded comments & more. It is tested major browsers – Mozilla Firefox, Internet Explorer, Opera, Safari and Chrome. 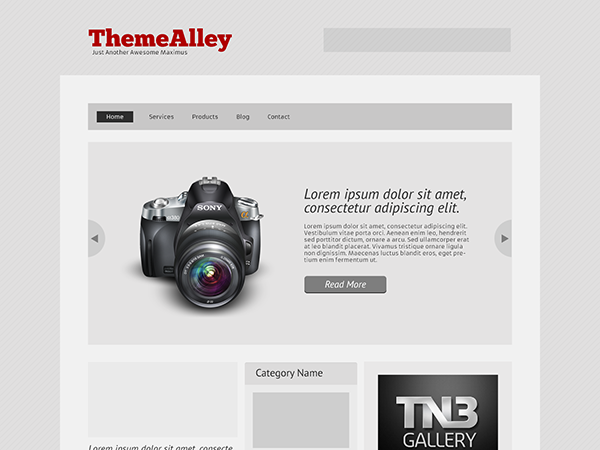 Cell theme is perfect for all WordPress user and theme developer who wants create premium theme from the scratch. 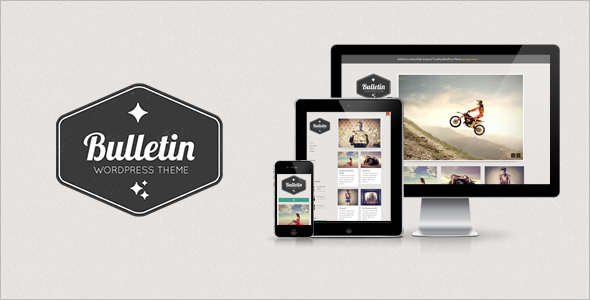 Spun is a clean, lightweight, responsive theme that steps out of the way to put the focus on your content. The theme’s navigation is hidden — hover anywhere to the far left or right of your screen to see links to previous and next pages or posts. Likewise, most elements in the theme – the header, entry information, and footer – are grayed out until you hover over them. 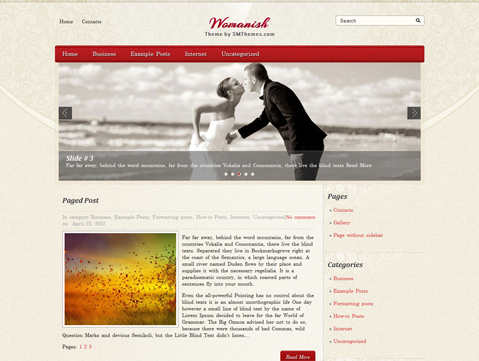 This simple and elegant WordPress template is great solution for women’s blog. Womanish, like our other themes, comes with Shared Bar that will help your visitors to share your blog with their friends. 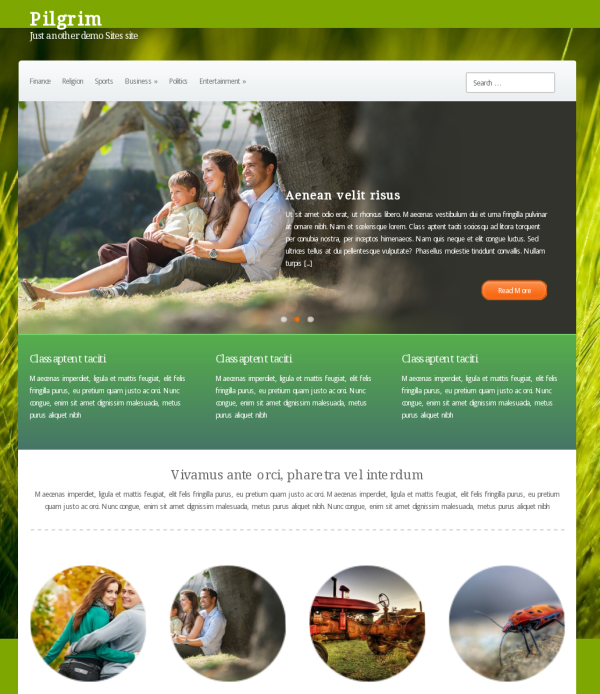 Tank is stylish and clean free WordPress template. It has aggressive looking design and comes with easy to use administrative panel, custom widgets, slider, menus and lots of other useful features. 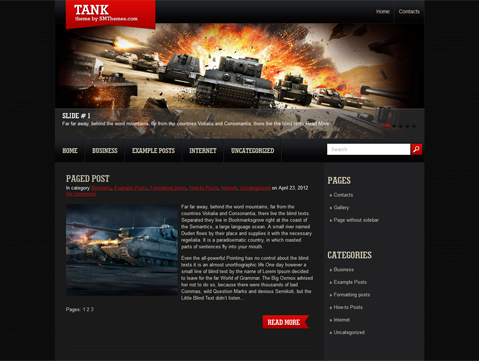 This theme is perfect foundation for peaple looking for World of Tanks WordPress theme. 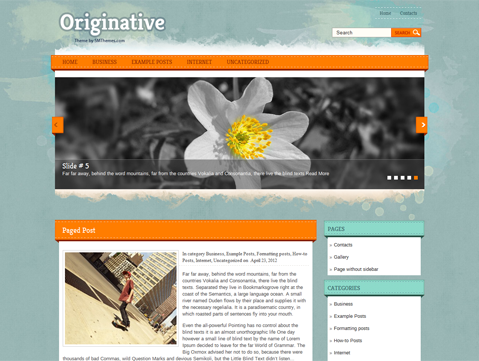 Originative is an amazing free WordPress theme that can be used with any type of content. Easy to use administrative panel, custom widgets, an eye catching related posts and lots of other powerful features provide a great base to build on. 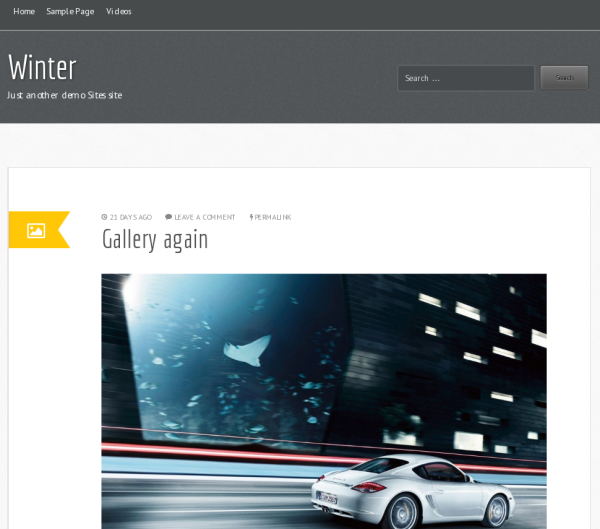 Winter is a single column free premium tumblog WordPress theme. 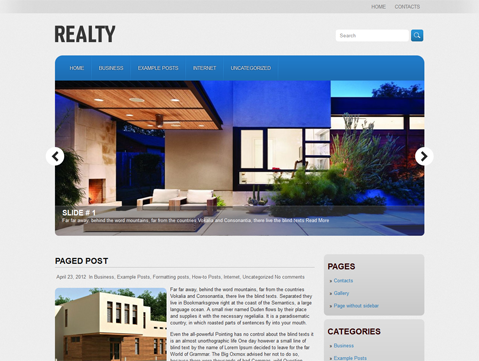 This is a WordPress 3+ ready theme with features like custom menu, featured images, Metabox, widgetized footer, and tumblog feature using the WordPress post formats. Winter theme supports Audio, Video, Image, Link, Chat, Quote, Aside, Gallery and Standard post formats. 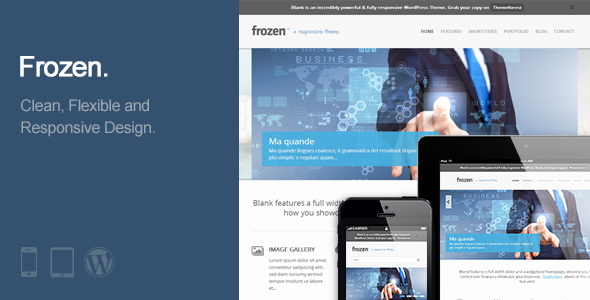 Frozen is a premium multi-purpose responsive WordPress theme and it’s created by using the latest HTML5 and CSS3 techniques. It is well suited to be a Corporate Business theme, a creative agency web presence or a personal site. 9studio is a stunning portfolio WordPress Theme design for creatives. Plus is a responsive WordPress Grid Multipurpose Magazine Theme (try resizing your browser), designed to present your news in a minimal and fluent way. A clear layout with tons of shortcodes and improvements. Aqua – WordPress Template is a Premium, Responsive, HTML5/CSS3 WordPress theme that features a clean and slick design that is suitable for a wide variety of websites. 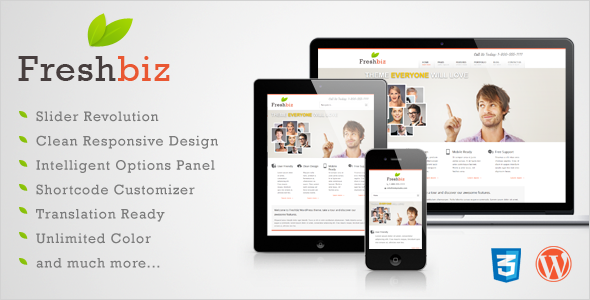 It utilizes Skeleton CSS Framework and is 100% tablet/phone friendly. Aqua – also includes the awesome Revolution slider (15$ Value), FlexSlider, jCarousel, Google Web fonts, unlimited colors, plenty of Customization Options and more to contribute to an enjoyable, intuitive and functionally exhaustive user experience. 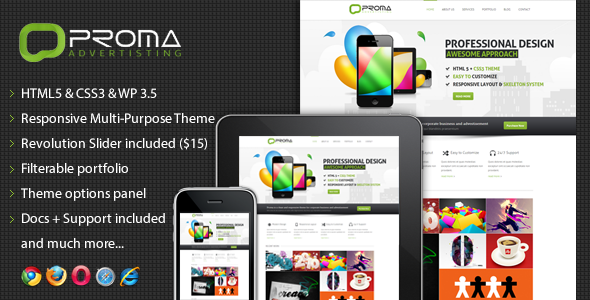 Proma is a clean responsive multipurpose WordPress theme, professional theme suitable for any business or portfolio, and it’s created by using the latest HTML5 and CSS3 techniques. 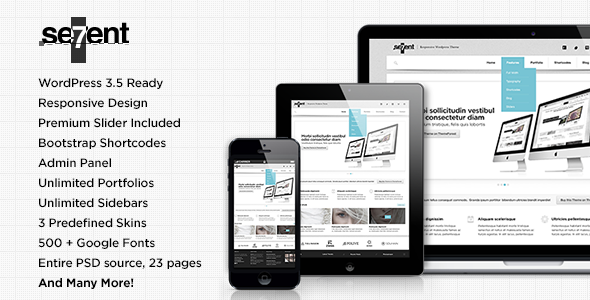 With a responsive design it is easily usable with any device (Desktop, Ipad, mobile phone…). Sevent is a convenient designed responsive and multi-purpose WordPress theme (WP3.5 ready) which is suitable for business, portfolio or personal blog websites. Our clean theme and page options guide you through building your pages, posts and portfolios. 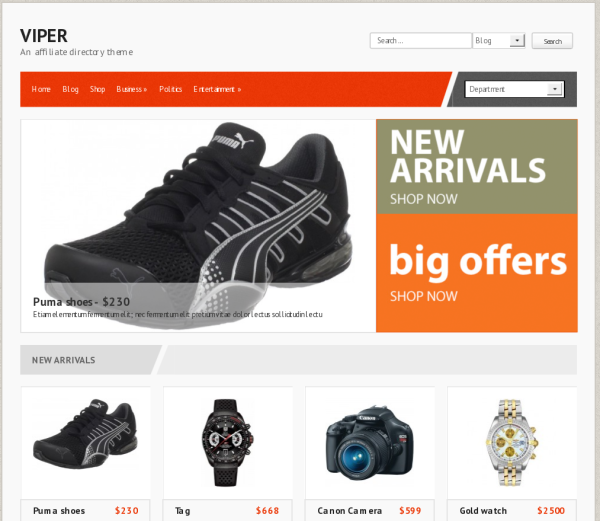 Build Image, Video (HTML5 (MP4,M4V), Youtube, Vimeo), Audio (MP3) or Slider Posts for your WebSite, Blog or Portfolio. 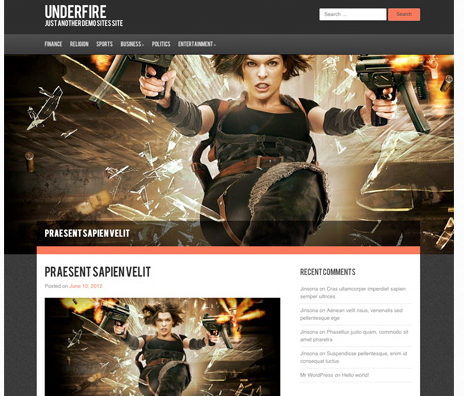 DONE was designed and concepted by ThemeForest Author Granth and produced (HTML,WordPress) by ThunderBuddies. 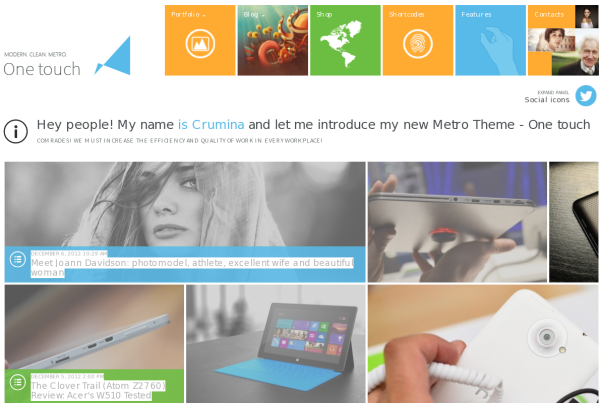 Good Collection of beautiful themes to use in a professional way for business sites designing. These are all legit themes to be used legally?